Oily and salty deep-fried food will soon be a thing of the past for 2,000 frail and elderly residents who have meals delivered to their door every day. On the menu, instead, will be healthier options with bite-size pieces cooked with less oil and salt, and made less spicy. Most of the food will be steamed. Many beneficiaries of the meals-on-wheels programme provided by various voluntary welfare organisations (VWOs) are too weak to cook at home or head out to eat. Some have found the food they get to be lacking in variety and nutritional value. The Agency for Integrated Care (AIC) has teamed up with Soup Restaurant, known for its home-style dishes, to make the meals tastier and healthier. The Health Promotion Board (HPB) will also provide nutritional advice, and has developed a set of nutritional guidelines for the elderly that will be rolled out to VWOs and commercial caterers. The AIC is looking to improve meals provided in the health-care sector, especially for those under intermediate and long-term care arrangements. Nursing home food was tweaked last year. "This programme is an extension of the nutritional movement that was launched last year with the aim of providing the elderly with good quality food so that they will not suffer from malnourishment," said Dr Amy Khor, Senior Minister of State for Health and Manpower. The programme is the largest meal delivery service for the elderly in Singapore, and its revamped version was launched by Dr Khor yesterday at Thye Hua Kwan Moral Charities (West), a VWO on Henderson Road. "This will enable our elderly to be healthier and have a better quality of life as they age at home and in the community," she said. Seven VWOs are likely to join the initiative by next year. Some 650 elderly people from Thye Hua Kwan (West) and Sunshine Welfare Action Mission will benefit from the new menu after Chinese New Year. The meals are subsidised by the Health Ministry, and cost less than $2.50 each. VWOs report increasing demand for meals-on-wheels services, and expect it to grow as fast-paced lifestyles catch on and more elderly people live alone. Some organisations have already taken the lead. Touch Home Care, for example, has recently reduced the amount of salt used in its dishes. 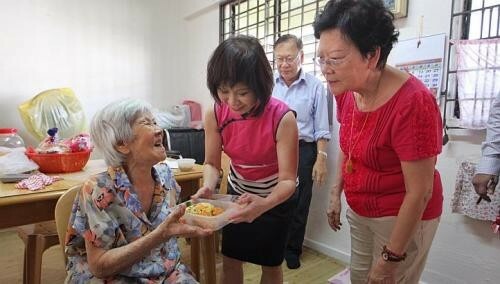 Madam Foong Kim Geok, 83, has been receiving meals at home since her knees and shoulders weakened several months ago. "The chicken curry used to be too spicy, and the doctor has warned me against food that is too salty." However, a special Chinese New Year meal of pumpkin rice, yam paste and seafood was delivered to her by Dr Khor and staff from Thye Hua Kwan yesterday. "It is like restaurant fare now," said Madam Foong.